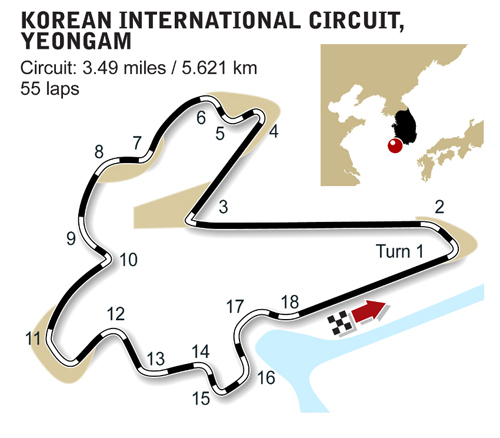 The decision to award a grand prix to Korea was greeted with mixed reactions, with critics quick to point out the country has no racing tradition and it was another case of the FOM putting money before anything else. The location was also an issue. While organisers wanted a venue near Seoul, they ended up with one in Yeongam County, more than four hours from the capital. The construction of the Hermann Tilke-designed circuit started in November 2007 but was still some way short of being finished by the scheduled completion date of July 2010, three months before the inaugural grand prix. Eventually the race went ahead, but the FIA had to bend it's own rules on homologation in order to proceed. The 3.5-mile circuit is built on 425 acres of reclaimed land beside an artificial seaside lake. The anti-clockwise track features the calendar's longest straight, allowing for speeds of up to 320km per hour. The grandstands accommodate up to 135,000 people, although the remote location means the capacity has yet to be tested. The original circuit designs showed plans for a marina and city centre development around the final sector of the track, but while the close walls show the intention for a street section, by the fourth running of the race there was still no sign of any progress. The organisers have a seven-year deal to host the race, with an option to renew for a further five-year term, but by 2013 the hosting costs have proven to be too expensive and the promoter described the chance of it being on the 2014 calendar as "50:50".